On Computers » HOW GREEN ARE YOU? The answer, according to HYmini.com, may be blowing in the wind. This company makes a wind-powered recharger that works with many cell phones, digital cameras, PDAs, older iPods and other 5-volt rechargeable devices. It’s fairly expensive: $50 for the base unit, plus $10 more for accessories you’ll almost certainly want, but what price are you going to put on being environmentally correct? 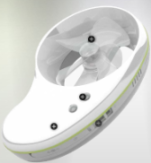 The little kidney-shaped device fits easily in one hand, and a little fan spins in the wind to charge its battery. We figure there’s a definite limit on how long someone is willing to stand and hold it up in the air, hoping for a steady breeze, so the accessory pack offers an easier way. A small case and clamp costing $10 lets you attach the HYmini to a bicycle handlebar or partially opened car window. Clipping along, the fan spins merrily and a recharge takes an hour or less. This provides enough power to run an MP3 player for two hours or a cell phone for 40 minutes. If there’s a decent breeze at your local outdoor cafe, you can sit and recharge (the HYmini, we mean} in about the same time. The company is throwing in a solar panel for $10 on a sale right now. The car mount, bike mount and armband accessories are all back-ordered until 2008.